Thesis title: Modulation of lateralised responses to primary affect. Iro's doctoral research explores the neurological pathways underlying primary emotional processing and visual attention. 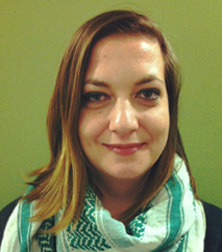 Prevalent themes in her research include the pre-attentive processing of threat; speed-accuracy trade off as a function of anxiety in the perception of primary emotions; approach/avoidance responses to perceived threat; and the exploration of individual differences in amygdala volume as a marker of differential and lateralised responses to emotional stimuli. Iro's thesis posits a modulation of lateralised response patterns to positive and negative affect by timing, individual differences, nasal/temporal display of emotional stimuli, and auditory threat. Iro has a DipRes in Psychology Research (Oxford Brookes University), an MSc (Merit) in Cognitive Neuroscience (Oxford Brookes University) and a BSc (Hons) in Neuropsychology (University of Central Lancashire). Ntonia, I., Savva, G., Joseph, L. & Freeman, E.D. (2013). Lateralised responses to angry and fearful faces are modulated by gaze direction and auditory threat. British Association for Cognitive Neuroscience Annual Meeting (Book of Abstracts). Ntonia, I. & Freeman, E.D. (2012). State Anxiety and Subliminal Threat. British Association for Cognitive Neuroscience Annual Meeting (Book of Abstracts). Ntonia, I. & Ntonias, S (2006). Hemispheric Lateralisation of Affect: Relationship to Handedness and Schizotypy. The 2nd Dual Congress on Psychiatry and the Neurosciences (Book of Abstracts): p.70. Module leader for Research design & statistics. SPSS clinics for Doctoral, DPsych, MSc and 3rd year Undergraduate students. Iro has also been a Visiting Lecturer at London Southbank University.